There is more to spices than pleasing the tongue. Each of them carries a role in a food consuming process. Some kick the appetite and some aid the digestion. Spicing is a delicate skill. We can sense only a couple of tastes at a time. It takes practice to know which spices to combine. They support the main ingredients and create a mood, like a background music. All parts of fennel are edible: root, stalk, leaves and fruits (seeds). Fennel seeds have a light green colour and a fresh, sweetly ethereal taste similar to anise and liquorice. Many Indian languages, including Bengali (mouri), contract the name for fennel from the Sanskrit origin, madhurika, which describes the sweet nature. Fennel is noticeably sattvic spice. Sattivic means the mode of goodness. It supports qualities like peacefulness, equilibrium and sustainability; whereas passion infused seasonings, like chilli, promote action, change and greed. Seeds are used whole or ground. Toasting them on a dry pan before grinding enhances the character. Mouri is an important part of Bengali cuisine, being an ingredient of panch phoron. It is a distinctive combination of five tastes: mustard seeds (or alternately radhuni), cumin, fenugreek, kalonji and fennel. Fennel is a natural mouth freshener. It has many medicinal attributes. To boost digestion and to help disperse flatulence or relieve gastrointestinal cramps, seeds are chewed after meal. 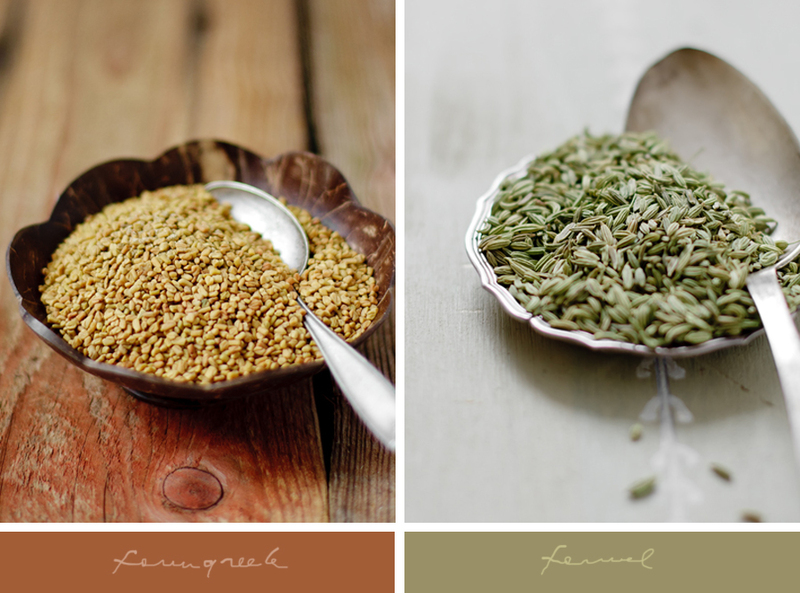 Fenugreek is an interesting spice. The seeds are a bit tricky to use because of their bitter nature that can overwhelm. However, bitter flavours are important in prompting bile, which aids digestion. Green leaves (kasuri methi) are fresh and delicious, and used as herbs. Their fragrance slightly resembles lovage. Technically fenugreek is a legume and belongs to the bean family (Trigonella foenumgracum). The seeds are easily sprouted and make a quick window garden around the year. Dry-toasted fenugreek seeds have an altered, nutty flavour and reduced bitterness, provided care is taken not to overheat them. Generally they are toasted in a low heat or quickly tempered before being ground or added to food. If they turn reddish brown, the result is extremely bitter! Unlike the yellow mustard seeds used in French/European cuisine, I prefer the tiny ones with a dark brown colour. They have a faint spicy smell and a peppery, rustic taste. Their fiery temperament increases the body heat and passion. Besides the dark brown seeds, there is also a black variety that is most pungent. The seeds are from the mustard plant, which is a cruciferous vegetable related to broccoli, Brussels sprouts and cabbage. The plant greens are delicious and used like spinach. Mustard seeds are entertaining fellows! When tempered in a hot ghee or oil, they crack, pop and create mini-fireworks in the kitchen! As fun as it is to see, it can be hazardous, too. There has been a time or two that a piping hot seed has hopped right into my face. Please, be warned! Mustard seeds are also used as garnishing. They are dry roasted or sautéed with chillies and fresh coconut and sprinkled on steamed vegetables, dal or savouries like dhokla or khandvi. They go well together with potatoes, cabbage and beans. Such a beautiful understanding of spices! Mustard seeds splattering on our faces is such a common affair for cooks in India that we don't give it much relevance...but for someone who is new to cooking with it or unfamiliar, it is such an important tip that you have given! Love the pictures of all the spices! They are my best friends! There are number of spices available in the market but I really like Fennel after the meal. File explorer of window which makes better interface and user friendly this program also tell us to navigate the different types of files and folder.It has also some additional features than older ones. We can sense only a couple of tastes at a time. It takes practice to know which spices to combine. The deal with the powerful item and all the funnel and mustered seed is very important and take all the basic need that you want to maintain all the time. but we have some solution for the simple authorized function like Online Viagra is the best for human health. SEO is not a simple task because now google accept only unique or fresh content or not in quantity but its want to quality so i would be recommend to all who wants to grow our business by SEO so outsource seo india with AnalogDigitalCafe is the best place. The blog post is very helpful for students. domain 1$ If you want hosting service here you can come and get the better service offer.